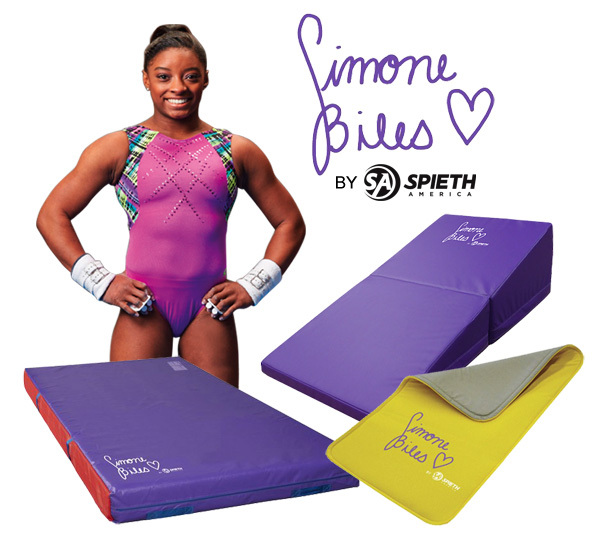 Gift Ideas - Simone Biles Signature Line - Norbert's Athletic Products, Inc.
Spieth America, with input from Simone Biles, has created the Simone Biles Signature Product Line so others inspired to grow their gymnastics skills can have access to the training tools Simone uses in her training. Simone became the most-decorated female gymnast in world championships history when she won four golds (including another all-around title), one silver, and one bronze at the 2018 championships to bring her career total at that competition to 20 medals. Simone Biles Folding Incline, 24" x 48" x 14"
Simone Biles Junior Training Mat, 4' x 8' x 4"